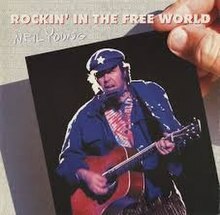 "Rockin' in the Free World" is a song by Neil Young, released on his 1989 album Freedom. Two versions of the song were released, similarly to the song "Hey Hey, My My (Into the Black)" of Young's Rust Never Sleeps album, one of which is performed with a predominantly acoustic arrangement, and the other with a predominantly electric arrangement. The song is now considered one of Neil Young's best songs. The song was ranked 216 on Rolling Stone's 500 Greatest Songs of All Time. Young wrote the song while on tour with his band The Restless in February 1989. He learned that a planned concert tour to the Soviet Union was not going to happen and his guitarist Frank "Poncho" Sampedro said "we'll have to keep on rockin' in the free world". The lyrics criticize the George H. W. Bush administration, then in its first month, and the social problems of contemporary American life, while directly referencing Bush's famous "thousand points of light" remark from his 1989 inaugural address and his 1988 presidential campaign promise for America to become a "kinder, gentler nation." The song also refers to Ayatollah Khomeini's proclamation that the United States was the "Great Satan" and Jesse Jackson's 1988 campaign slogan, "Keep hope alive". The song was first performed live on February 21, 1989, in Seattle with The Restless, without the band having rehearsed it. The song is rated number 216 on Rolling Stone's 500 Greatest Songs of All Time and is included on Young's Greatest Hits (2004) release. It reached #2 on the Billboard Magazine Mainstream Rock Tracks chart. The song was played during Donald Trump's grand entry preceding his formal announcement that he would run as a Republican candidate for the 2016 presidency. Young, a longtime supporter of Bernie Sanders, said that Trump's use of "Rockin' in the Free World" was not authorized. Sanders has since used the song at his own political rallies. The contention was later determined to be a licensing issue, was resolved, and Trump's campaign used the song. Young explained to Rolling Stone that he had no issue with the campaign using the song. ^ Buckley, Peter (2003). The Rough Guide to Rock. Rough Guides. ISBN 978-1-84353-105-0. ^ a b c d Greene, Andy (14 July 2015). "Flashback: Neil Young unveils 'Rockin' in the Free World' at 1989 Seattle gig". Rolling Stone. Retrieved 15 November 2018. ^ "Neil Young Chart History: Mainstream Rock Songs". Billboard Magazine. Retrieved 2019-01-20. ^ "Neil Young to Donald Trump: Don't Rock in My Free World". Mother Jones. 16 Jun 2015. ^ "Neil Young: I'm OK with Donald Trump Using 'Free World'". 2016-05-24. This page was last edited on 11 February 2019, at 18:49 (UTC).